A che ora giocate? Forse mi uniro' un giorno. Che cosa e' il nome del server? The solution is simple. Just spawn more shadow creatures progressively when you are insane. At some point there's gonna be too much of them to be able to survive, so you must manage your sanity and at the same time this mechanic doesn't kill NF farming. Wortox is very overpowered. People who suggested that pierogi/dragonfruit pie are comparable to Wortx'es healing must be joking. Time needed to be able to gain big stack of pierogi and dragonfruit pie is huge compared to Wortox healing ability. Not even mention time for building farms, birdcages, collecting resources etc. Wortox shouldn't be able to heal himself, but only allies. His teleportation is better version of Lazy Explorer what is ridicules. You can't even get Lazy Explorer during ruin rush (except chests ofc), and can't get it before winter. Wortox has it since beginig. Like WTF And for people who complain about sanity loss. Since when being insane is bad thing? I understand it can be difficult for new players, but even mediocre player shouldn't have troubles survivng insanity. Am I the only one who thinks that Wortox looks more like dog with horns than freaking goat? I thought the same about that Metheus is Ancient Queen. Also the red light what we see in New Reign trailer is similar to ruins nightmare phase and Anicent Fuelweaver. But then I realised that Queen has no motive. On ancient murals we see that Queen wanted to save her people and fight shadows. Why would she become such a dark monster who wants to kill every survivor? Humans didn't take part in the downfall of Ancients (as we believe). Personally I think, that Shadow Charlie isn't as innocent as we think. Most of us think that Monster Charlie plans everything and controls her better counterpart in some way. But there is one thing what many have missed. Both part of Charlie wanted Throne. If Shadow Charlie had no interest in ruling she would just leave after releasing Wilson. But no, she decides to pick up the Throne and gonna sit on it as a queen. Then Monster Charlie decides to take an advantage and inner fight begins. Firstly, we don't even know who is a king of Elder Bog. I doubt it's Gnaw, he seems to be just a monster in that world. About Pugna we are sure about that he is in opposition to Them and Charlie, based on his quotes. https://clips.twitch.tv/EncouragingProudPuppyYouDontSay It seems Winona had no idea about the Constant at all. Maybe, eventually it wasn't her pinboard? I have a little different theory about this. Let's start with chronology. We see Shadow/Monster Charlie in the portal instead of Queen Charlie, that means Wagstaff and Winona were taken before New Reign. In this time Wilson or Maxwell was sitting on the Throne. We can't say which of them. Everything will be clear after release of Wagsaff as a playable character. If he will be unlockable through experience that means he went to Constant while Maxwell's rule. 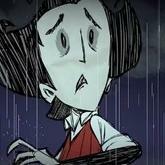 But Winona appears in the Constant already in DST, so Wagstaff couldn't be there before. The question is what happened to him and why we don't have him as a playable character. Maybe someone imprisoned him to make use of his knowledge. We have two possibilities: a) Maxwell Wagstaff due to his knowledge is very valuable prisoner. Maxwell could order him to build clockworks. And besides technical engineering, we have genetical engineering. In Don't Starve world we can encounter many weird creatures, all of them seem to be mixture of animals, for example Deerclops, Goose/Goose, Dragonfly, Bearger etc, etc. Probably some crazy scientist is responsible for it. And Maxwell can recognise most of them. After all Wagstaff seems to be more into technical things than biological. So maybe someone else made them. b) Charlie After Winona repairing the portal we instantly see Charlie. This indicates that she could take him to the Constant and imprison him. We still don't know what Charlie was doing during Maxwell's reign. Possibly she would use Wagstaff in the same way how Maxwell would. Also we got Winona after Charlie took the Throne. We don't know what happened to Winona after stepping through the portal. Maybe she was trapped the same way like Wagstaff to help him create things, and she was released as a Survivor later, when she wasn't needed anymore? I spotted another interesting fact. Charlie on family photo has bow instead of rose. Is it important?